The book-hunter whose heart is in his quest never tires of tales of lucky discoveries, and of rare books bought for a song. This is natural enough, and moreover, authentic details of some great find invariably stimulate his eagerness, and encourage him to persevere in the search for what he is repeatedly being told—as though he of all men did not know it already—is only to be met with casually, and by the merest of accidents (32). Books about books is my forte. And I have a number of books by or about book hunters in my library that I enjoyed reading: The Book-Hunter by John Hill Burton (1863), The Book-Hunter in Paris by Octave Uzanne (1893), A Shelf of Old Books by Mrs. James T. Fields (1894), The Book-Hunter in London by W. Roberts (1895), Diversions of a Book-Lover by Adrian Joline (1903), A Sentimental Library by Harry B. Smith (1914), The Amenities of Book-Collecting by A. Edward Newton (1918), The Book Hunter At Home by P. B. M. Allan (1920), Penny Wise & Book Foolish by Vincent Starrett (1929), Carousel for Bibliophiles by William Targ (1947), The Adventures of a Treasure Hunter by Charles P. Everitt (1952), Gold in Your Attic by Van Allen Bradley (1958), Old & Rare: Thirty Years in the Book Business by Leona Rostenberg and Madeleine Stern (1974), and Used and Rare: Travels in the Book World by Lawrence and Nancy Goldstone (1997). This book, Rare Books Uncovered, is not covered by a dust jacket! This book is about rare books that were discovered in unlikely places. Yes. 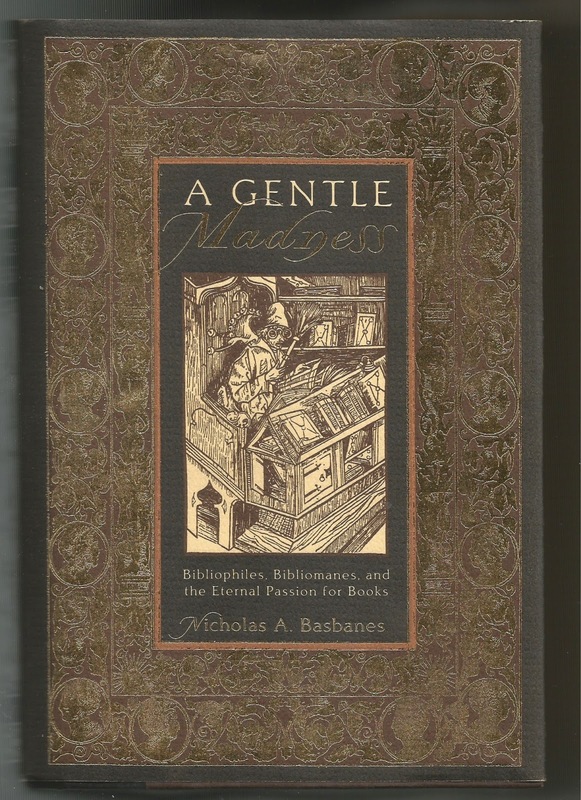 You can add Rare Books Uncovered to the list of books about book hunters that I enjoyed reading. Thousands of people read A Gentle Madness. And I expect thousands more will read Rare Books Uncovered. 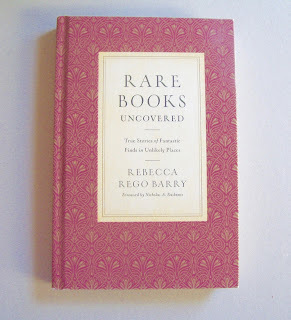 You don't have to be a book hunter to enjoy reading these 52 tales of lucky finds revealed in Rebecca Rego Barry's book. And you don't have to be a book hunter to find rare and special books either. Some of the finders whose stories you will read in Rare Books Uncovered didn't know the first thing about book collecting. But knowing a little bit about books helps to know how fantastic your find is. Of the 52 finders in Rare Books Uncovered, at least half of them identify themselves as booksellers. At least six of the finders identify themselves as book scouts, which is a modern-day term for book hunters. And at least 15 of the finders identify themselves as collectors. One book collector even describes himself as a bibliomaniac! Bookwise or not, you will enjoy reading Rare Books Uncovered. And you will even pick up some of the book lingo, for Rebecca has included marginal notes for the "newbie," defining such words and phrases as incunabula, point, doublure, provenance, flyleaf, watermark, printer's device, and, my favorite, an Historiated Initial. Sounds painful, doesn't it? It was not painful for some of the finders when they learned the value of their lucky finds—especially the one who found at least $8.9 million worth of comic books while cleaning out the house of a recently departed relative. This finder was neither a bookseller, a book scout, or a collector. But it was months before he realized the value of his find. Of the 52 finds, three were found while clearing out houses, three were found on eBay, three were found at library sales, one was found in a dumpster, another was found in a trailer park, two were found at flea markets, two were found at book fairs, at least four were found in bookstores, and five were found at auctions. I won't tell you where the others were found, or what the finds were. You will find out when you read this book. Finally, did I mention who wrote the Forward to Rare Books Uncovered? 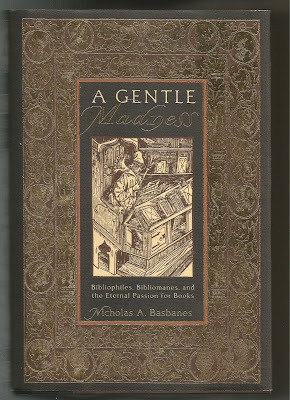 Nicholas A. Basbanes, the author of A Gentle Madness.